You guys are playing at the German ASOT 400 party. Are you looking forward to it? What can the party people expect of your set? What is ‘a state of trance’ to you? Any other exciting news we should know about? Shane: “It could seem we didn’t do much in the past couple of months, but in fact we did new songs for ourselves, quite a few remixes, but they’re all waiting to get released. There’s one song, ‘Helpless’ which we did with LA-based songstress Aruna, now that’s one we’re really proud about. Is there anything you’d like to say to Armin? 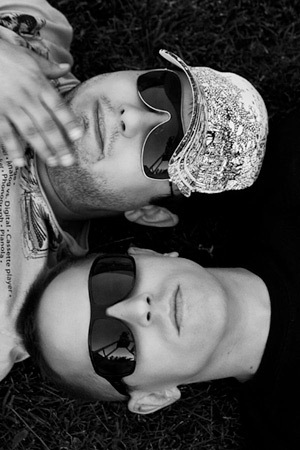 For more info on Myon & Shane 54, check www.myspace.com/myonandshane54 . Where would A State of Trance be without the input of new talent? Right, nowhere. Two major names in the infinite stream of upcoming producers in today’s trance scene, are Hungarian beatmakers Myon and Shane 54. Two boys with the right pack of knowledge teamed up not so long ago, but received support by Armin from the very beginning. A sign that there was more to these two youngsters than just a lucky hit. And right he was. Myon & Shane 54 have grown from talents to ‘regulars’. But their music goes far beyond the ordinary, regular or plain. Same goes for their message to all of you. Find out what the guys have to say in their special ASOT 400 video!